After a short-lived 2.5 years as music-inspired CrazyWorld Café, 24 Temple Street had a makeover and re-opened as a 40-seat restaurant in August 2013. 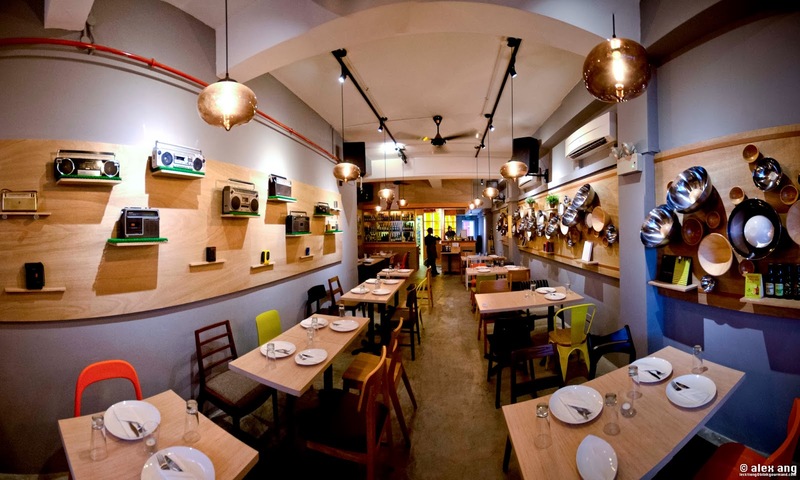 Named for its street address on Temple Street – just steps away from Sri Mariamman Temple and directly opposite Lau Choy Seng shop – Table 24 is probably not the most imaginative moniker for a new eatery but one can’t fault its meticulously thought-through interior that provides a much needed reprieve from the hubbub of touristy Chinatown. Feature walls brandishing vintage Walkman, stereo sets and a mélange of stainless steel and wooden mixing bowls line the entire length of the walls that frame a cozy dining room of blond wood tables against a mix-mesh of wooden and metallic chairs. For their first full fledged restaurant venture, owners Edgar Lim and Florence Chua – who operated CrazyWorld Café before its transition to Table 24 – roped in a third co-owner to oversee the new stainless steel-clad open kitchen. Self taught chef, Richard Lee, is no newbie to F&B: his father owns Seng Kee Bak Chor Mee and he’s worked the front of house in local eateries before deciding to take on the kitchen full time. 4 years after learning his cooking chops in various restaurants across the USA, Lee returned home to call his own shots at Table 24 with Lim and Chua as business partners. 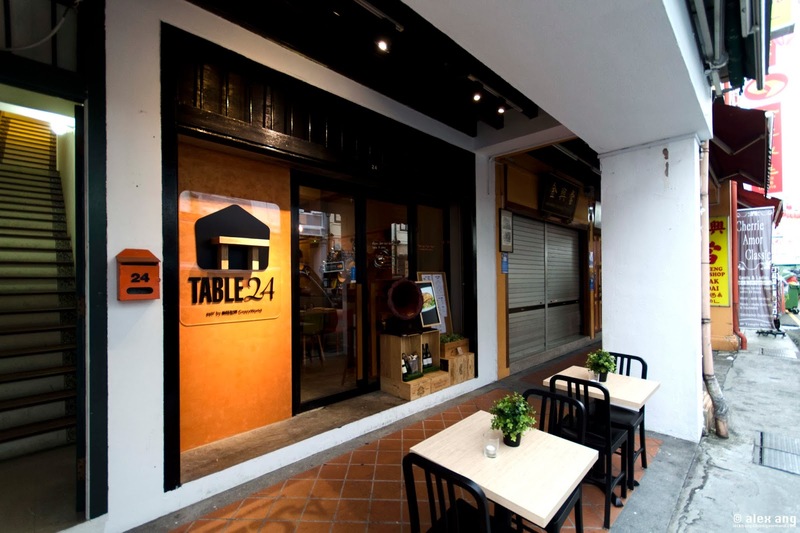 The tagline at Table 24 is “an unpretentious take on fine dining”. In another words, the trio wants to take the fuss out of fine dining to make it affordable to the masses. 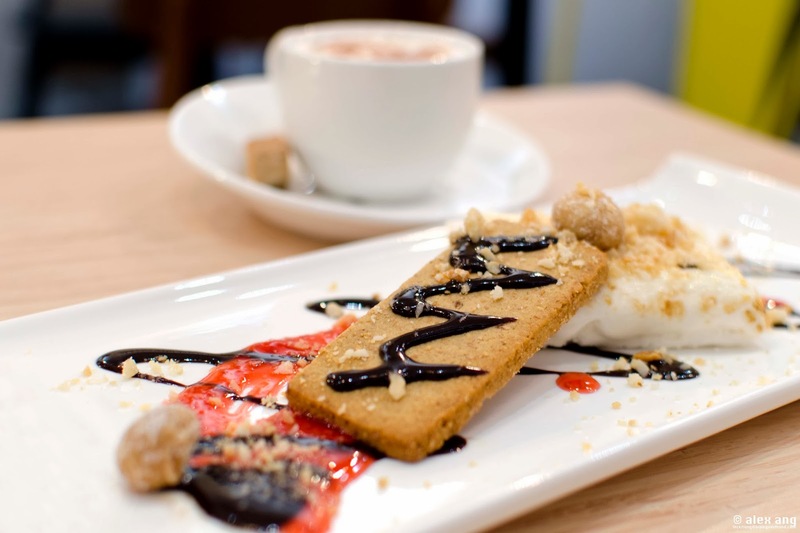 Leveraging on Lee’s wide-ranging kitchen experience cooking Italian, European and Southern American cuisines, Table 24 offers a seasonally changing menu of New American cuisine that incorporates global influences (including Asian). To keep quality consistent and costs low, everything – from marshmallows to bacon – is made from scratch in the kitchen. Lee’s western fare more than pass muster, with some off the charts good dishes and others we wouldn’t re-order on our next visit. 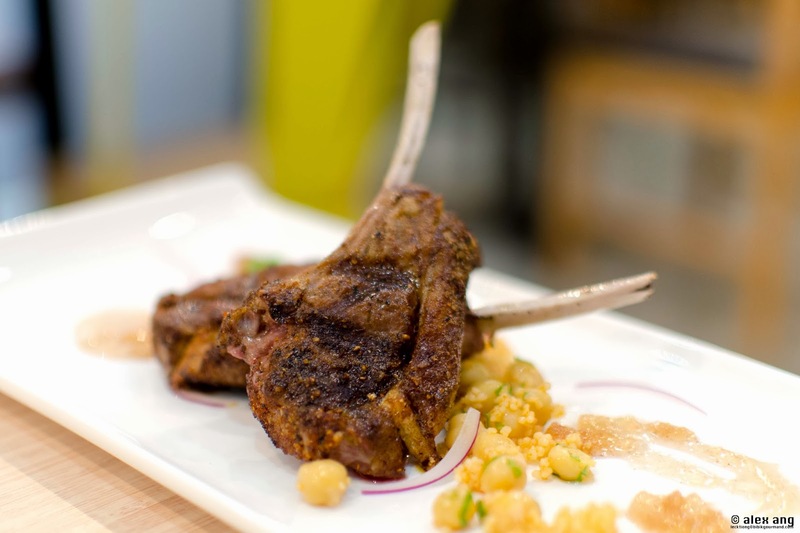 Top on our re-order list is Lee’s Middle-Eastern inspired lamb chops (S$16), a starter of 2 sticks of grilled Baharat spice-rubbed lamb chops resting on a mélange of cumin-accented cous cous and chickpeas, with a dollop of sweet onion jam on the side. 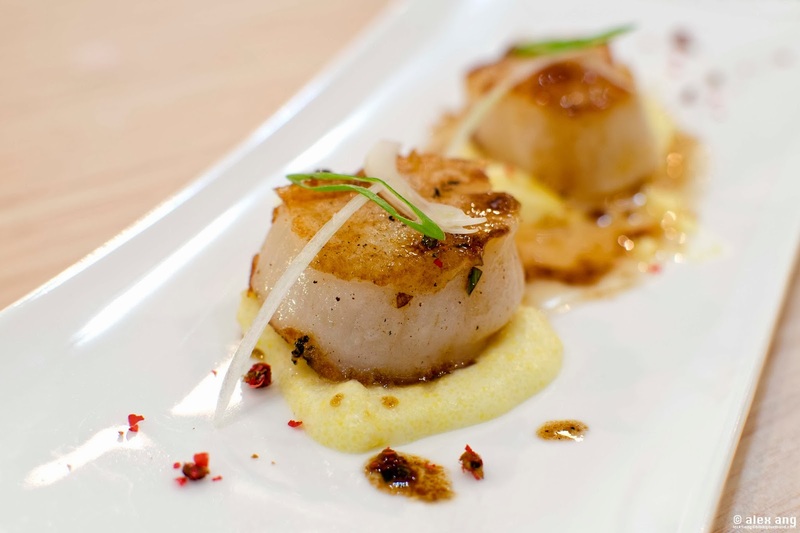 The pan-seared Hokkaido scallops on corn polenta (S$14) also hit the sweet spot with a savoury pink peppercorn-flecked brown butter-balsamic sauce; as do the half shell Tasmanian Pacific oysters (market price) drizzled with a hint of tarragon and lime mignonette. 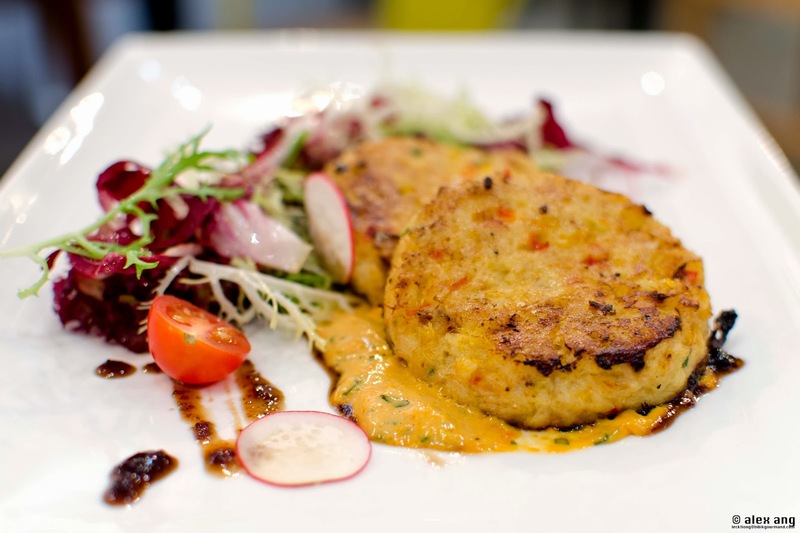 The American classic of Maryland-style crab cakes (S$25) too stand out with its rich and savoury crustacean flavour thanks to its more-crab-than-cake recipe. On the downside, the dish is let down by a soggy inside and less-than crusty finish. 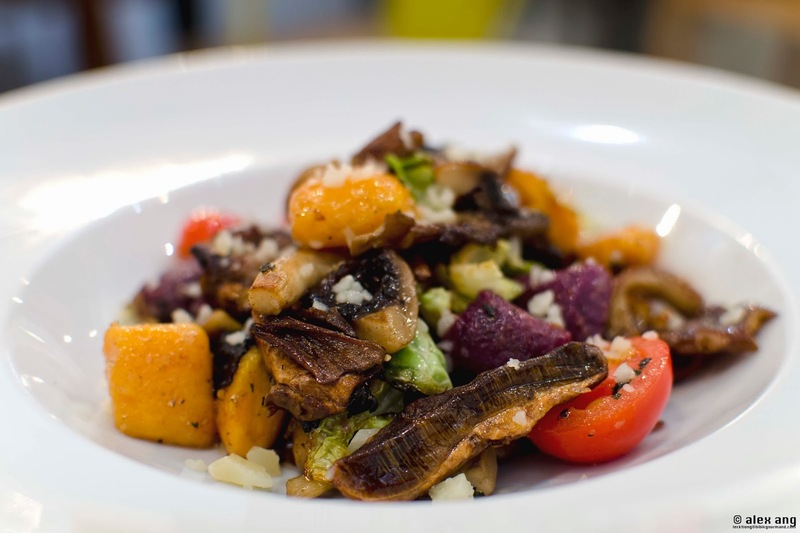 While we much refer our gnocchi with a light olive oil based pesto dressing, Lee gets creative with a duo of purple and sweet potato gnocchi (S$19) sautéed with Brussels sprouts, cherry tomatoes and a medley of mushrooms. Save for the overwhelming flavour of the sweet potato gnocchi, it’s a pleasant vegetarian-friendly dish. And yes, we also like our gnocchi a little lighter and softer please. 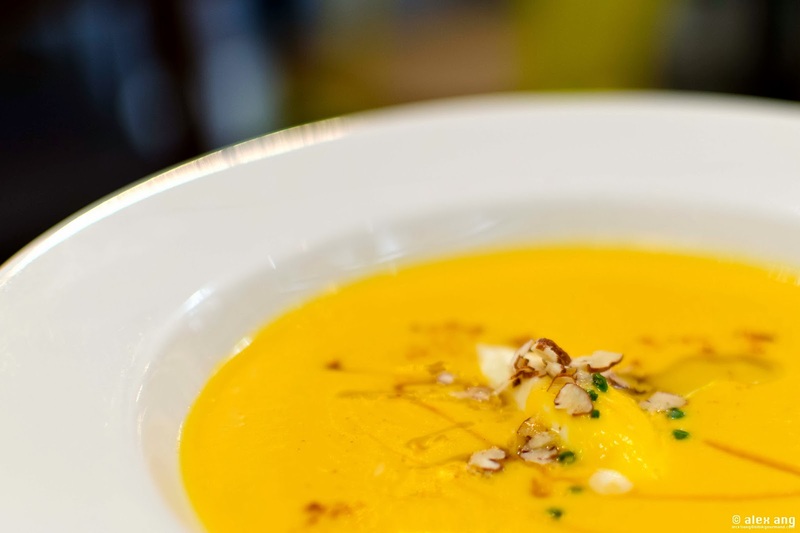 But the butternut squash soup (S$7), while all smooth, sweet and velvety, falls flat on the palate with a single dimensional flavour. The addition of a dollop of crème fraîche buffers the monotonous tone but does little to lift it. Whilst not everything is pitch perfect, Table 24’s 3-course prix fixe menu is worth returning for. For S$42++ per head, you pick an appetizer, an entrée and a dessert from a curated list (a subset of the a la carte). If the latte-inspired pot de crème (S$9) and homemade s’mores (S$9) are any indication, the desserts cut the mustard too.